Interest in funder collaboration has exploded in the last five years, with a huge number of reports extolling the tantalising benefits. Foundation networks consider collaboration to be one of the most critical strategic issues. But the practice of funder collaboration lags well behind the rhetoric. Funders prescribe collaboration as a good thing for others, but do not always take their own advice. 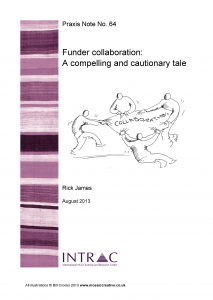 In reality many foundations remain deeply ambivalent about funder collaboration. What everyone agrees on is that there is limited practical evidence to draw on. There are few documented examples of funder collaborations – and fewer still that are candid enough for others to learn from. This note contributes to redressing this imbalance in a small way. It explores the experience of a significant collaboration between four foundations that had the vision and courage to pool their funding to work together on a joint project. This paper outlines the story of this collaboration, the effort involved, and the mixed outcomes. It identifies the major learning from this experience – highlighting seven top tips for foundations, international NGOs and bilateral donor agencies contemplating collaboration with other funders.